His master must bring him to the Elohim and make him approach the door or the doorpost, and his master shall pierce his ear with an awl and he shall serve him forever. What are the Elohim? When the word appears as a singular it means the one true God; in the plural it most often means idols or lesser celestial powers or beings. The context here provides for either. The Rabbis, alert to the problem, read Elohim as "judges" and suggest that the ear piercing is to occur on the court-house steps. The bible critics however have pointed out that ANE scholars have discovered that it was once common for household idols to be kept at the doorpost; moreover, often oaths or other declerations relating to the household would take place in front of them. So what does this verse mean? Per the Rabbis: His master must bring him to court and make him approach the door or the doorpost, [of the courthouse] and his master shall pierce his ear with an awl and he shall serve him forever [the legal rite having been performed in a legal setting. President Bush released $32 million for emergency assistance to the Palestinians. The money Bush released Tuesday evening "for the purpose of meeting unexpected and urgent refugee and migration needs" is part of $40 million that the United States pledged in an emergency fund-raising appeal from the U.N. Relief and Works Agency, the body administering to the needs of Palestinian refugees. Explanation for the slow, the stupid and anyone who may have crawled in from Yeshiva World: I don't think Bush is all about the legacy. I didn't think Clinton was all about the legacy either. Get it? We're in the boring season. The sea has been split, the Jews have been brought out of Egypt, and after 4 months of fascinating parsha stories, we're about to hit the dessert. DH aficionados say that the sudden break in the action after the big FX scene at Sinai is proof that the book of Exodus, at least, was cobbled together by many hands. In particular, they say the stories are J and E, but the descriptions of the Tabernacle are P, reasoning that only priestly writers would be quite so interested in their own institution. [Yes, they muster other evidence, too, evidence like linguistics, content, continuity and language choices.] They say that the inclusion of the Tabernacle description was an exercise in vocational vanity, and one having no literary merit. Robert Alter (who?) has a long essay [here page 304] which argues against this position. In sum, he says that to an ancient audience the pageantry of Trumah and Tezaveh (the two parshiot that seem to interrupt the narrative) was every bit as exciting as a car chase is to us. Though Alter believes that an editor (or school) finalized the Pentateuch, he insists that, for the most part, they brought forth a literary whole that hangs together as a work of art. His analogy, in fact, are the cathedrals of Europe, created over centuries by many hands, but cohesive works of great power all the same. I'd be pretty satisfied with any of the Democratic candidates. On the other hand, I have to say that, as a spectator, I'm much more fascinated by the Republicans. Watching those shifty, devious, unscrupulous creatures clawing at each other in spasms of demagoguery and pander is like beholding the whole vile, fear-driven history of humanity. Overnight I posted a photo in the empty space above [you can see it here] that's been unfortunately misunderstood. (My fault: I should have anticipated the misunderstanding. I forget that not everyone sees nasty, power-mad Rudy the same way that I do.) So let me apologize to all who were offended, but, by way of explanation, the point of the photo wasn't that Rudy is an Italian, but that he's a fascist wannabe who has been described by Jimmy Breslin as "a small man in search of a balcony"
It is my unfortunate duty to report that the YeshivaWorld editor appears to have caught the stupidity bug from his commenters. Attached to a story about Obama the non-Muslim (Seen first here!) the Editor has attached a photo of Barak with his arm around Al Sharpton. The caption: Barak Obama / Al Sharpton '08. Worse, the not-so-bright-editor-man has arranged things to make it seem like the Obama/Sharpton picture came from the JTA! A heiliga reader from the far-right of the Judaism's Conservative sect has been explaining to me that some Conservative clergy go to rabbinical school to learn how to be Jewish. As a result, they have plenty of book knowledge, but not the cultural experience. I find that very interesting because the cultural stuff, the stuff so many of my neighbors consider essential to Judaism, could have worked out differently. There's no good reason why the Eastern European food, for example, won out. The Moroccan or Persian dishes, for example, could have been what we all consider Jewish food, instead. Same with dress and pronunciations, and, well, everything. Sometimes I try to imagine an Orhtodox Judaism that's every bit as halachic as ours, yet looks, tastes and feels completely different. Then I remember: Even the halachic parts weren't inevitable. Jack from the Shack is now running Havel Havelim. The first edition under his stewardship has been posted. So far, though, it looks just like HH 1.0 only maybe not quite so unrepentantly right wing. I see via TTC that the front runner got on the phone with members of the Jewish media to debunk the "Obama is a Muslim" email all of us have seen. On the one hand, I like the fact that Barak is taking the time to address the dirty tricks head on. One of the many things Kerry did wrong four years ago was that he never bothered to address the Swift Boat lies. They were on television and unreflectivly echoed in the so-called liberal media for weeks before anyone connected with the campaign took the time to explain why the whole thing was bogus. By then, it was too late and Kerry has been hamstrung. So its nice to see that this Democrat isn't going to sit back and let himself be slimed. On the other hand, I'm not sure I like the fact that Obama is quite this concerned about an email being passed around by a bunch of Orthodox Jews. There aren't that many of us and this little hoax about Obama being a closet Allah-worshipper hasn't been picked up by the main stream media. Is he just a very through and careful campaigner, or does Barak Obama harbor the anti-Semite's suspicion that our small and insignificant community influences (or, dare I say it, controls) the national conversation? Just some stray thoughts... not sure I have any opinion. Click, and look at the bottom right corner. This is the store front causing an uproar in Brooklyn. These are the salacious photos that have led the Rosh Yeshiva of Chaim Berlin to call for a boycott of the store until the pictures are removed, on the grounds that these stylish headshots are corrupting the thoughts of the precious talmidim of his exquisite yeshiva. If it does the same to you, I apologize, but I did use the post title to try and warn you. I have to be honest, though: I was expecting a whole lot more skin. Mr. Eggy had a very good point when mentioning the fact about[Obama's] middle name. I don't think it should simply be brushed underthe carpet. Middle names speak volumes about people.Take FDR for example. People would have never known he was from Delaware had his name not been Franklin Delaware Roosevelt. So too in this case.Thank you Mr. Eggy for your thought provoking point. I want to believe this is a parody, but its so hard to tell! 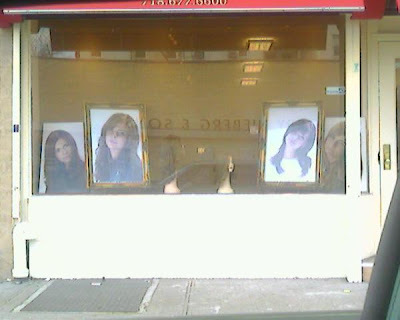 A wig store in Flatbush is under threat of a boycott for displaying salacious photos in its window. Not an underwear store. Not a lingerie store. Not even a pizza store, where, heaven forfend, men and women might sit together. This is a wig store. So what's the story? Is the owner of the store a high-ranking idiot who is attempting to sell wigs to Orthodox Jewish woman while dirty pictures hang in his window, or does the organizer of this boycott need to re-calibrate his or her sensitivity meter? We won't know until we see photos of the photos. A hundred DovBear dollars to the first person to supply them. Heaven help us if there are any Jews who agree that a vindictive, philandering adulterer is a "mensch." And perhaps someone from the right like Gulianni supporter Moshe Klass of the Jewish Press can explain to me why Clinton's affair with Lewinsky was any worse than the shabby way Rudy treated his ex wife? Click on the photo to see the strange etchings on the wall. You don't like people from outside the state coming in and telling you what to do with your flag. In fact, if somebody came to Arkansas and told us what to do with our flag, we'd tell 'em what to do with the pole; that's what we'd do. 1) The South Carolina flag is a perfectly nice flag, featuring the palmetto plant, about which no "outsider" has ever offered any free advice. One might add a couple of other points (continues Mister Hitchens). The political flag of the Confederacy—the so-called "Stars and Bars"—is one thing. The battle flag of the Confederate army, the most militant symbolic form that secession and slavery ever took, is quite another. Under this fiery cross of St. Andrew, the state of Pennsylvania was invaded and free Americans were rounded up and re-enslaved. Under this same cross, it was announced that any Union officer commanding freed-slave soldiers, or any of his men, would be executed if captured. (In other words, war crimes were boasted of in advance.) The 13 stars of the same flag include stars for two states—Kentucky and Missouri—that never did secede, and they thus express a clear ambition to conquer free and independent states. And this is the symbol that Huckabee, seeking to ingratiate himself with the lowest element and lowest common denominator, calls "your flag." You might as well do a cross-burning and have done with it, and we all know how the networks would react if some ignorant kids did that. Or as Roger Ailes said: It's nice to know that the cross before which the Reverend Huck kneels has the smell of gasoline and burning wood. Did anyone notice the little spat in the comment on the Nebenzahl post at Hirhurim which mentioned Leone da Modena? Gil called him "controversial." Lipman (uber-yekke) posted that it is stupid to call Modena controversial. He was a perfectly frum rav; why don't they call the Besht controversial? I responded that Gil called him controversial because he was/ is controversial. I then called attention to his self-confessed gambling addiction and to the allegation that he wrote the heretical Kol Sakhal. Gil tells me that actually he had known nothing about the gambling and the Kol Sakhal, until I brought it up. He meant that he was controversial because he wrote against kabbalah. I asked why that isn't lashon ha-ra. Gil didn't understand why it would be. I reminded him that many people think he is an apikores because he opposed kabbalah. Gil professed not to know what I was talking about. Here's a little secret: The rich people benefit from this war in ways that you and I do no. Don't believe me? Think about it. The end of Dass Torah? The ADMAR has another noteworthy article posted on his non-blog about child abuse in right-wing communities. Though all of what he says is as wise as ever, be sure to review the 200+ comments. They don't appear to have been written by the sort of dissatisfied rabble-rousers who hang out here, yet still they overwhelmingly disapprove of the way our famous big name rabonim handled the issue. I won't pile on, both because I respect famous big name rabonim, and because I don't know what the famous big name rabonim knew or when they knew it. However, I do want to grab this opportunity to add my name to the list of bloggers (1, 2 and more) who have previously mocked Avi Shafran for the insulting to the intelligance spin Avi has attempted to put on the abuse cases. The man is a tool, more worried about the honor of his bosses than he is about the safety of children. I don't know if the Kolko fall-out will giveour community a healthier and more realistic understanding of famous big name rabonim, their roles and their power. But let's hope that it teaches us to ignore professional spinmeisters like Avi Shafran. Law and Order SUV had an episode a few weeks ago that included some scenes in "Khilat Moshe," an upstate Hasidic enclave plainly based on Kiryat Joel. Hat-tip: Like most of the good stuff on this blog, we have Amshi to thank for this. Are women the blacks of Orthodox Judaism? Yesterday, LADYKAYE posted [link] on raising Orthodox daughters. A few hours later, we received this parody. The point, I think, is clear. Take this recent conversation with my 8 year-old, for example. I don't remember why, but we were discussing Funtown, and I was explaining what Funtown is and what a person does at an amusment park. A light of recognition went on in her eyes as she suddenly remembered the neighbors young son -- younger than she is now -- had visited Funtown last summer. "Oh, like Benjy did last summer! I saw him wearing a Funtown T-shirt!" So I answered her, "Yes, last summer Benjy went to Funtown"
I don't know why I didn't see it coming. My daughter asked immediately, "Next summer can we go to Funtown?" I hesitated for a long moment in which various discourses on the precise meaning of "seprate but equal", and my personal opinions regarding the precise meaning of Plessy v. Furgeson exploded through my head.). Also in my head, louder than any of these things, was the following: "I am not going to say one thing to my daughter that will in any way, shape, or form send her the message, subliminally or otherwise, that she is in any way at all inferior to a white boy. Nothing. Not one bit. Regardless of what might happen next." So I finally babbled out an answer that was probably more lame than any apologetic explanation of Plessy v. Furgeson, and my answer was as follows: "Actually, we probably could go to a black amusment park, but for some reason Funtown in particular is for white kids only." And for some reason - God's grace, most likely - she was quiet and asked nothing further. But she will. Of course she will. And I don't know how many more lame answers she'll accept. It's the bizarro primary. Last is good! Uh? What? Even Ron Paul is beating mayor 9/11 like a drum. Hell, I've won as many primaries as Rudy has. Meanwhile, you may have seen the great article in the Times yesterday about just how petty, vindictive and mean Giuliani was as mayor. Really quite shocking. Meet Rabbi David Batzri the magical matchmaker. The height of the service is when Batzri tosses hard candy at the congregation, with a promise that those who catch it will find a match. So basicly this is the bridesmaid and the bouquet idea, with a Jewish twist. Say what you want, but would you rather get hit in the eye with a hard candy or with soft flowers? His space already had the requisite brick walls and wooden floor. He added brown-and-white checkered tablecloths, installed smokers and special food warmers in the kitchen, and invested in photographs of smoke — like ethereal ink blots — for decoration. Years ago, Mr. Levy had installed a sink near the entrance so patrons could wash their hands before reciting the blessings over their kosher meal; he decided not to remove it and to improvise instead. “Now they can wash the pork off their hands,” he said. What I am about to say is silly and rediculous, and a rank anthropomorphization besides, but I do feel a little bad for the sink. Its fate brings to my mind the anguished words of arch-heretic Elisha Ben Avuya who, upon seeing the severed tongue of a Torah scholar on the ground, is recorded in yHag to have said: Shall the mouth that uttered pearls [of widom] lick dust? Tuvia Stern, the Charedi man beaten on Sunday by Bet Shemesh extremists has asked me to post the following message. I wanted to share a few words with you about my feelings the past few days. Yesterday, I spent much of the day crying – how could a Jew do this to another Jew? I think I was crying so hard because there is no real answer to that question. As I cried, I reminded myself of this past Erev Rosh Hashanah. I had the privilege of standing by the kever of Rabbi Nachman of Breslov in Uman along with tens of thousands of other. Among the many tefilos that came out of my heart, I asked Hashem to bring peace to the city of Bet Shemesh. That the people who support violence should have their eyes opened and that the various communities should be able to live with their differences and have the problems worked out through peaceful means. As part of my introspection, I thought about violence and how it destroys our lives, families, and cities. Violence derives from the belief of "kochi veotzem yadi" – that power comes through physical force. Rabbi Nachman taught otherwise. He wrote in his sefer, Likute Moharan, that the main weapon of the Messiah – and, in fact, each individual Jew – is prayer. We have to engage the physical world. However, our true power comes from Hashem through our tefilos, through our "voice" and not our "hand." I ask that everyone who cares take time out and say a few words to Hashem. We should pray that violence – in all of its manifestations, on all levels, personal and communal – have no part in our lives. If we can take Rabbi Nachman's message as a response to what happened, and then apply it to ourselves, then I think that we are on the right path. R' Stern we salute your courage. Readers are encouraged to leave messages of support on the comment thread. Why does everyone here believe this story absolutely without any reservations? What kind of Chareidim are floating around beating up people? Aren’t most young people in Yeshivas or Kollelim and not around to beat anyone up? If they belong to some mosad, what do the leaders of that organization have to say? The whole thing sounds bogus and is the usual typical anti Orthodox unsubstantiated slander. I think every Jewish leader who signs a Kupas Hair solicitation brochure needs to go on the record about Ramot Beit Shemesh. They should each sign a Kohl Koreh denouncing the violence, the thugs and their leaders. They should also make it clear that anyone attempting to organize a violent attack must be reported at once to the police. Furthermore, Kupas Hair should announce that they aren't going to funnel any of our charity contributions into the hands of hooligans and thugs. If you agree, please contact Kupas Hair (24-hour hotline 866-221-9352 or email info@kupathairusa.org) and tell them. I had an experience a number of years ago wherein a woman I like very much, who happens to be a leading member of the Orthodox feminist movement, started showing signs of liking me less after we had a conversation about women's tefillah groups. I complained to a friend, and the friend said "Well, she probably thought you were more liberal than you are." I responded, almost without thinking, "Well, I AM more liberal than I am." The friend laughed, because she knew what I meant: that I have many powerful feminist tendencies and opinions, but for any number of reasons, they don't generally translate into practice. This has become much, much more apparent, as well as more difficult to manage, as my daughters have gotten older and begun to ask pesky questions. I find their questions pesky because I refuse to lie to them or give them anything other than the whole truth, the real truth, and nothing but the truth; but too often, the whole truth conflicts with the reality they know, and I have no reasonable means to make the two coincide. Take this recent conversation with my 8 year-old, for example. I don't remember why, but we were discussing aliyot, and I was explaining what they are and what the person says when he's called up. A light of recognition went on in her eyes as she suddenly remembered the rabbi's young son -- younger than she is now -- receiving an aliyah last Simchat Torah. "Oh, like Benjy did on Simchas Torah! I heard him making that bracha!" So I answered her, "Yes, on Simchas Torah, little boys do it too." I don't know why I didn't see it coming. My daughter asked immediately, "Can little girls do it on Simchas Torah?" I hesitated for a long moment in which various discourses on the precise meaning of "kavod ha-tzibur", and my personal opinions regarding the precise meaning of kavod ha-tzibur, exploded through my head, as did the silly explanation I received once for why children get aliyot on Simchat Torah (I personally find it silly). Also in my head, louder than any of these things, was the following: "I am not going to say one thing to my daughter that will in any way, shape, or form send her the message, subliminally or otherwise, that she is in any way at all inferior to a male. Nothing. Not one bit. Regardless of what might happen next." So I finally babbled out an answer that was probably more lame than any apologetic explanation of kavod ha-tzibur, and my answer was as follows: "Actually, little girls probably could, but for some reason most shuls don't do that." I am pleased to report that Yeshiva World is siding with the victim of the recent Bet shemesh attack. Around 8 oclock, I was on my way to a yarzeit seuda for a friend's mother . I went down into the parking lot and noticed that the back and read windows of my car were smashed to pieces. An innocent bystander happened to be there and I asked him what happened. He responded that he had no idea. I looked to the left and saw a gang of at least 20 people. They screamed "chaptzem" and I started running. In the meantime I heard them say "grab his cellphone." They caught up to me and started brutally hitting and kicking me. After what seemed to be an eternity, they ran away. Afterwards, I asked around to find out who did it. I was told that it was a group known as the "Mermelsteins," which is a sect that broke away from mainstream Breslov and is one of the most vocal supporters of the violence here. He has asked me not to name him. Harry Maryles and others are reporting that this cowardly attack was organized by one Avraham Yitzchak Mermelstein. I've verified this independently. You can reach this man at 845-781-8025. Tell him DovBear says hello, and that we're all sick to our stomach. I'm waiting for a statement from the Orthodox Jew who was brutally attacked by zealots yesterday in Ramot Bet Shemesh. I hope to have it soon. 2 - Contact Yitzchak "beyond the pale" Alderstan via the comment section at his blog and ask him if labels like "beyond the pale" are reserved for Nosson Slifkin, or if maybe he can find the energy/guts to criticize the barbarians of RBS as powerfully as he's criticized woman prayer groups. 3 - Contact Avi Shafron at Aggudah and ask him to please summon some outrage. His ire and indignation are never in short supply when a Reform Jew says something positive about homosexuals. Ask him why his voice has vanished now that Orthodox Jews like you and me are under attack in Ramot Bet Shemesh. While you're at it contact the editor of YeshivaWorld (via the blog) and ask him to stop being such an insufferable coward. 4 - Contact Yanky Horowitz via the comment section on his blog, and tell him you want this issue front and center, starting now. We can back burner the at-risk teens for a few days. In fact, the behavior of these haredi Jews in Ramot Bet Shemesh - specifically their attacks on other Orthodox Jews - are driving people away from the religion of our ancestors just as surely as badly trained HS teachers are. 5 - Call Kupat Hair and tell them that you're cutting them off - no more donations, period - until they affirm that our contributions are not being used to support the hooligans of RBS. 6 - Call Moshe Friedman 972-57-317-7844 and tell him you've seen his name and words attached to almost every RBS story published in an Israeli paper. Tell him he appears to be a spokesman for the community. Tell him you want an unequivocal denouncement of the attacks, and if it isn't immediately forthcoming tell him he is neither a man nor a Jew. 7 - Put this post on your own blogs. Its time to say enough. Its time to push back. The world, or at least the Orthodox Jewish world, is watching. Kanoim beat opponent in RBS. Break his windows. Steal his cell phone. The video shows R' Shmuel Berenbaum ztl "talking in learning" with R' Leib Bakst ztl but what are they arguing about? I've always thought it borderline retarded to cast Bill Clinton as anti-Israel. The man invested eons of time and peta-liters of personal credibility into a plan that he sincerely and honestly believed would save Jewish lives. You readers on the right may have though him disillusioned and innocent and unable to recognize that his plan had no chance of success. You may even view him as gullible, or consumed with polishing his reputation. Fine. But none of that is synonymous with being anti-Israel. At best (worst?) perhaps Clinton was guilty of being anti-Likud, but at the time the same could have been said about a majority of Israelis. Those of them who cast votes for Rabin and Barak were on the same ideological page with Clinton. If Clinton was anti-Israel, so were two of her prime ministers, and most of her voters. What constitutes "Pro-Israel", and who appointed or commissioned anyone to cast a judgment on the issue? Does it constitute being "Pro-Israel" to support settlements? Is it pro-Israeli to pressure Israel into signing some peace agreement and dismantle settlements? An American presidential candidate repeatedly pledges his eternal love for and belief that a united Jerusalem should and will remain Israel's capital. He then proceeds, as president to refuse to move the US embassy to Jerusalem. Is he then considered pro-Israeli or just a pandering politician? (Answer: when he said it, he was genuinely pro-Israeli and of course he meant it, as he said in Boca Raton to Cohen and Levy during the campaign. When he didn't move the embassy, it was because of the Arab-loving pencil pushers at the State Department and the corrupt Saudis who control Washington). But the issue deserves a more elaborate answer. So let's take a brief, broad-brush look at several past presidents who are case studies. Richard Nixon for example. His background, education, early years in Congress, loathing of the northeast liberal establishment, borderline anti-Semitic remarks made while in the White House hardly made him a prime candidate for centerfold in "Pro-Israel Monthly' magazine. 85% of US Jews voted for Humphrey and McGovern. So was Nixon "Anti-Israeli"? No. History will judge him as the president who rehabilitated the Israeli Defense Forces after the 1973 Yom Kippur war, launched the annual military grant to Israel and pulled Egypt away from Soviet orbit. Jimmy Carter, now there is a real anti-Israel president. Oh really? His involvement in the Camp David negotiations was critical and indispensable in enabling Israel and Egypt to sign a peace agreement that has ever since been a pillar of stability (not much "peace" though) and part of Israel's national security posture. Ronald Reagan, now there is a true Zionist, a man who embodies and defines pro-Israelness. No kidding. Who sold F-15 jets and AWACS planes to Saudi Arabia? Who consolidated the US-Saudi alliance which in turn contributed to the emergence of Islamic fundamentalism and Wahabi extremism? It sure wasn't Barack Obama. Yet Jews voted for Reagan in unprecedented numbers for a Republican (35%). So Carter facilitates a peace deal between Menachem Begin and Anwar Sadat, and Jews vote for Reagan. They did so for perfectly legitimate reasons. They did so for "American" reasons because they thought he'd be a better president than Carter was. Ah, you say, then came George H.W. Bush, AKA "41". He really hated us. Didn't his secretary of State, James Baker say: "F**k the Jews, they don't vote for us anyway." And didn't he complain about the pro-Israel lobby? And didn't he impede the loan guarantees? But Bush 41 presided over the disintegration of the Soviet Union, the elimination of Iraq as a viable threat against Israel from the east and invaluably assisted Israel (and never asked for credit) in bringing Ethiopian Jews to Israel. Bill Clinton was the greatest friend Israel ever had. Until he involved himself in the Israeli-Palestinian process which included recognizing the PLO, establishing a Palestinian Authority and would have entailed, had Camp David in July 2000 produced an agreement major territorial concessions. Then he was somewhat less pro-Israeli in the eyes of some. And then there is the new greatest friend Israel ever had, the big W. himself. Contrary to all presidents before him since Truman, he called for the establishment of a Palestinian state, an end to Israeli occupation (his words, last week in Jerusalem) and further strengthened ties to the Saudis. He also attacked the wrong menace in the region. Iraq instead of Iran. Of course it's Colin Powel's fault, then Condi Rice's infatuation with Palestinian "suffering". The point is, an American president is "Pro-Israel" when he profoundly appreciates the basic friendship with Israel, when he respects Israel as a democracy, when he truly believes in Israel as an idea and an enterprise. When his core value system and strategic outlook is similar to that of Israelis. Evil anti-Semites crack down on pious, blameless, law abiding Jews. I called Rabbi Moshe Freidman at the number you posted. We spoke twice, and both conversations were in Hebrew. The first time, I told him that I am concerned, becuase I have heard about horrible things in Ramat Beit Shemesh. He said, "what have you heard?" I mentioned that I heard of a woman being beaten on a bus for not moving to her 'appropriate' seat. RMF replied at first that he knew nothing about this. I said, "oh, well I am glad, because from what I have heard, there is a big chillul hashem going on." He then said, "who am I speaking with?" I answered that I am an Israeli presently in Los Angeles, and I am writing an article about what is going on. RMF then revealed that he knows far more than he first let on, by saying, "I will not speak with you from Los Angeles, but I will speak with you in Israel if you like." I continued to ask questions about the details, and RMF hung up. I called back and said that I want to get the opinion from the side of the 'pashkvellers' for my article. He again re-iterated that he knows all about the situation, and will only talk to me in Israel. I said, "I don't want to make anyone look bad, I just want the truth. Why can't you talk to me now over the phone, so I can write about it?" He said he will only meet face to face, and he had a bad experience once with journalists, so he likes to meet face to face. I wonder why. He also stated that "we don't care what you write about us." I thought the use of the plural first-person pronoun was quite revealing. That was the end of the call. Who's next? NOTE:If you choose to call Rabbi Moshe Friedman to ask about the violent events he is alleged to have orchastrated, please be cordial and polite. Where are the GOP Jews now? I was in Borough Park this past Shabbat. The (politically RW freebie) Jewish Herald had big photo of W and Olmert beaming together with caption "Friends in Deed". The Jewish Press proclaimed something definitive as "Bush Visit Comes At Tense Time In U.S.-Israel Relations..."
Didn't Bush call for a Palestinian state and Israeli sacrifices? Isn't this something you expect from "the Suha Kisser?" I hear crickets chirping from the RWJ's gallery. I think its cognitive dissonance. The fools have spent so much mental energy convincing themselves that Bush is God's own angle that they don't' quite know what to do with all the evidence to the contrary. Its sad, actually. Many of them cope by attacking the Clintons with the same tired and discredited accusations they've thrown at that poor, hardworking couple for more than 10 years. See for example Jason Mausz of the Jewish Press. I'm really disgusted at the hyperbolic praise Bush has been getting for stating the obvious. During his recent trip to Yad Vashem, our famously incurious president saw an aerial photo of Auschwitz and, according to an eavesdropping museum director, asked his Secretary of State: Why didn't Roosevelt bomb it? A perfectly obvious question, no? And one most of us ask well before our fiftieth birthday. So why is the Yeshiva World community throwing roses at his feet? I don't blame the YW readers for being unaware that Bill Clinton expressed precisely the same sentiment at the dedication of the U.S. Holocaust Memorial Museum in Washington in 1993 --and not in the form of a wistful, infantile question, either. But why haven't they read to the bottom of the article referenced in the post? That's where they would have discovered that Bush isn't the first American president to have acknowledged the glaringly self-evident: The Allied war managers blew it. It's also a little odd to see the YW crowd celebrating the president for weeping a little as he toured the museum. Bill Clinton also cried when he went to Yad Vashem, though if memory serves, the right dismissed that another Slick Willie trick. They said the same thing when Hillary Clinton cried in NH a few weeks ago. Her tears were a cold and calculating move to make herself appear human, but Bush's were real? How can you tell? Those of you who read the paper, or fine blogs like Cross Currents, know that a group of zealots (ie Kanoim, ie hooligans) have been making life difficult for the good people of Ramat Bet Shemesh. They set fires. Throw rocks. Beat women. And more. Recently, I've been pleased to learn that the law-abiding people of RBS have finally said Ad Kaan (enough). Over the past number of years, expats from Bet Yisrael and Meah Shearim have purchased apartments in RBS, and like all expats they've had trouble adjusting to their adopted communities. Instead of assimilating, or keeping to themselves, the new residents of RBS are attempting to use violence to rebuild the city in their own image. This has been going on for about 5 years. Their say their goal is to "increase the holiness of RBS," but their tactics, which include vandalism, death threats, harassing phone calls, beatings and arson, suggest something else. To date, the police have been reluctant to get involved. To my mind, the real criminals are the planners, and the Rabbis who offer them aid and comfort. One of the Rabbis is Shea Rosenberger, a Rabbi (group 4) who was approached by Ilan Shmueli, the owner of a RBS pizza shop, that had been targeted by the thugs. Shmueli wanted Rabbi Rosenberg to help stop the violence. Instead the Rabbi brushed him aside with a warning: "You might end up dead." Another thug is Chaim Luzer Heimlich (group 2) I'm told Chaim Luzer was the organizer of the pizza shop attacks described by the New York Times on November 2, 2007 Heimlich is also accused of attacking one of the anti-hooligans. As the story goes, Heimlich saw the man, and with a few phone calls arranged for a mob to come and harass the man with name-calling, shoving and spitting. One of their rising stars is Moshe Friedman (group 2), gabbai of the Tiferes Yerushalayim shul. He is quoted in many newspapers articles about the ongoing violence in RBS, and appears in the video link above. R'Friedman is said to pay for pashkevlim with money he raises in England and Williamsburg. Allegedly, some of this money is also used to provide the hooligans with stipends. About a month ago, after a woman was viciously beaten on a RBS bus, the other side began to push back with a demonstration for peace which was attended by over 1000 people. The leaders of these law-abiding RBS citizens are now receiving telephones death threats at their homes at all hours of the day and night. They have been told by the thugs to prepare for their own funerals, and they have been threatened with cherem and all forms of violence. I am told the local Degel Hatora representatives, Moshe Montag and Shmuel Greenberg, are working to HELP the extremists get free land for their yeshiva. When you contact the Charedi MKs tell them to order Montag and Greenberg to stop supporting extremists hooligans. PS Get a load of this! The good guys hit back and played a trick on the chief thug. 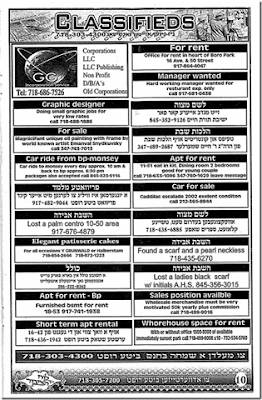 They took out an ad in the local paper advertising Moshe Friedman as a salesman for contact lenses! Is the famous Shin Bet afraid of a blog?? All the polls predicted an Obama win in Iowa, some by a large margin, yet Hillary walked away with it. Nice. And it only took 24 hours for the error to be corrected, and even then the correction came only after a reader pointed out that here, on planet Earth, Obama won Iowa. Also not-shocking was the revelation that Klass favors Rudy Guliani and Fred Thompson: two losers who are all style and no substance, not unlike the sort of Judaism he sells in his newspaper. You'd think that after almost 100 years of Eliezer Ben Yehudah's dream of a modern Hebrew language, and 60 years of a Jewish Sate in which Hebrew is supposed to be the native language, they would have actually developed a modern Hebrew language. Unfortunately, that's not the case. I wanted to find the hebrew word for "shotgun," for which I want to do a gematria. A quick reference to http://www.milon.co.il/ gave me the answer: "Roveh Tziyad." But all that means is "hunting weapon." Up in the hills and hollows of Live Frei or Die Land, the local Yanknecks sure have a lot of hunting weapons, and even a nice Jewish boy like me who gets queasy at the sight of blood knows that you can't take down a moose or deer, let alone an angry bear, with a shotgun. So a "roveh tziyad" could just as easily be a high powered rifle in our neck of the woods, or even (and I'm thinking about this survivalist I know who lives up in the bush) a Gallili assault rifle. Fortunately milon.co.il provides a link to the Hebrew Wikipedia page for "רובה ציד." "Roveh Tziyad," or the be more precise, "shotgun," (free translation, "roveh kaduriot" -- "gun of little balls/pellets.") is a gun with an ammunition different from that of regular guns. ["Why is this gun different from all other guns? :) ] There is no term in Hebrew for the foreign term "shotgun." Generally, the term "hunting gun" us used in Hebrew when one wants to refer to a "shotgun" because many hunting guns are, indeed, "shotguns." Yeah, and many cars are "motor vehicles," but it is useful to have terms that can differentiate between a Volkswagen Rabbit and a class 8 semi-truck, and, indeed, Hebrew does have such terms. So why has the Hebrew Language Academy been asleep at the switch on this one? Roveh Tziyad is a totally imprecise word for this object, and thus, Real Jews have to use a foreign term, written in a foreign alphabet, at that, if they want to refer to this useful object. What's wrong with the term "roveh kaduriot?" I say that Ben Yehudah's dream has failed. And I have a problem, as I can't decide whether I should do my gematria on "roveh tziyad," or "roveh kaduriot," or the word "shotgun" transliterated into Hebrew letters. Did you say Parshas Haman? Hey true believers, good news! Anyway, all you have to do is read Parshas Ha'mon, and you too will receive miracle food! Sustenance will fall from the heavens! Checks will miraculously appear in your mailbox! No need to go to college, or to train for a vocation! No need to do anything at all! It will be like being back in the Garden of Eden before that lousy woman and her pet snake wrecked everything! Haha! Just read Parshas Ha'mon and presto! instant cold hard cash!! Or something. Keep your day job, just in case. DovBear makes no guarantees. Nachaum Sarna (a Jewish reader) also takes it this way, and explains that this mention of an "order of Malkizedek" suggests that a longer story about the king, and perhaps his order, was once known in Israel and that the psalmist is referencing material (perhaps biblical material?) now lost. From you will emerge the priesthood and the kingship that your children will inherit from Shem your progenitor, the priesthood and the kingship, which were given to him. דִבְרָתִי מלכי-צדק. The “yud” is superfluous, like (Lam. 1: 1): “the city that was once so populous (רבתי).” Because of the speech of Malchizedek, because of the command of Malchizedek. You are a priest, Heb. כהן. The word כהן bears the connotation of priesthood and rulership, as (II Sam. 8:18): “and David’s sons were chief officers. For instance: (1) If the yud is superfluous, why is it there? (2) When did Malkizedek say anything about the future kings of Israel? What command did he give? Alter (also a Jewish reader) (I think) goes a third way, writing that the reference to Malchizedek is a pun (the word means "righteous king") He takes the verse as "you are a priest forever, by my solemn word, my righteous king." He sees no reference here to any lost literature and, unlike Rashi, no reason to depart from the plain meaning of the words. Yet not once does Hashem ever say, 'Oh, and by the way, I'm gonna give you the Torah'. Of course there's the easy and obvious answer, but why go there? I'm sure the olam here can come up with all sorts of imaginative non kefiradick vertlach. We give them $50 billion a year and all Bush got was a T-shirt? Our system for choosing a president is absurd. 1 - We vote in November because the Founding Fathers wanted to wait until the crops were in. We vote on Tuesday because the FF wanted church-goers to vote, and thought scheduling elections on Tuesday would give people time to both attend services, and travel to the county seat to cast their votes. In other words, the considerations used to inform this policy are 100 percent out of date, and should be reviewed. I think we should able to vote by telephone, or by computer, from our homes for, maybe, the entire month of November. 2 - Currently, a few hundred thousand people in backwards and cow-heavy states like New Hampshire and Iowa are allowed to set the national agenda. They liked Hukabee, Obama, McCain and Clinton, so suddenly these four people matter? Why should the headlines, and the slant of newspaper articles be determined by such a small segment of the population? I think the whole primary system should be abandoned. Let's go back to smoke-filled rooms, and let the party heavyweights decide. Or lets have one national primary. Or better yet, let's skip the primaries altogether and go straight to the national election. If it means 20 candidates will be on the final ballot, all the better. 3 - The electoral college is anti-democratic. The guy who gets the most votes should be president. End of story. 4 - The electoral college corrupts the campaign. For example, the electoral college votes of Florida and Ohio are currently significant, so we can expect the candidates to spend an inordinate amount of time in Ohio and Florida kissing up to the voters of that state. They'll ignore NY, and the tens of millions of voters who live here, because the polls say NY will vote democrat no matter what. This is both ridiculous and unfair, and not just we NYers deserve some kissing up, too. Why should a few million voters in some mediocre state like Ohio be permitted to swing the entire election? ...I don't thing the granite-headed opinions of the people of New Hampshire are any more, or any less, significant than the cow-centric attitudes of the people of Iowa. The ellipse, RSRH says, creates a parallel between this verse, and the one that appears later [8:16] about Kinim: ויעשו כן החרטמים בלטיהם להוציא את הכנים ie: the magicians did likewise with their secret arts to remove (להוציא ) the lice. The words ויעשו כן החרטמים בלטיהם appear in both places, and from this RSRH concludes that in both places, the magicians were attempting to perform the same sort of act. Thus, according to RSRH the verse about frogs should be read: "The magicians did likewise with their secret arts... (to remove the frogs; and instead)... they brought frogs upon the land." "I knew them all. I buried all these people. Now they are all in pieces"
"I knew them all. I buried all these people. Now they are all in pieces," Jack Oziel, 91, said with red eyes as he surveyed the damage at the Poile Zedek Cemetery in New Brunswick." How Did The Egyptian Magicians Create Frogs? Josh Waxman has a sort of scientific answer that doesn't really fit the verse, but in my opinion his post makes a fundamental mistake. Namely, why is he presuming that the magicians created anything? But Josh Waxman isn't average. So why is he pretending otherwise? (1) Worse, the average Orthodox Jewish Adult gets upset when you tell him that his first grade understanding of parsha is superficial; he also angrily dismisses clear-cut rishonim, when you attempt to show him that Rashi's or the Midrash he was taught is disputed. (3) Rabbi Eliezer says the court magicians created frogs. The Sages, as recorded in Shemot Rabba, say that they could only gather the frogs in one place. They couldn't be created ex nilo. What does this mean for Aaron’s Best, Supreme and Habor? Update: Shmarya has had it for four days. With details. This is the already famous video of Hillary Clinton allegedly crying this morning. Do you see any tears? I don't. And even if she did weep a little, big deal. Means nothing. Some people cry. Some people think. Some people talk in coherent sentences. GWB does none of the above. The end of Orthodox Judaism? Memo to those smarty smartensteins yelling "gotcha." When I used insulting words like "yokel" to insult the insult-worthy people of Iowa, I was attempting to be insulting. That's why I chose the insulting words, see? Oorah, on the other hand, was probably not trying to offend anyone when they used the word "lady" in a situation where SWE calls for the word "woman." Get the difference? I was trying to offend, Oorah was not. Speakers of yeshivish understand that in that dialect of English "lady" and "woman" are interchangable. Those who do not speak yeshivish, however, are likely to detect an unintended note of irony or condencension when "lady" is used as a synonym for woman. As a man of the 21st century, I respect Oorah for asking its supporters for their opinions on matters of policy, but as a Torah True Jew I am deeply offended. Can't they just find a Rabbi, preferably one with an extra long beard, and just do as he says? Should Oorah use photographs of ladies in its promotional materials? Oorah is proud of the wide range of people who support kiruv through our organization. They reflect the entire range of Jewish communities from Chassidish to Modern Orthodox. Since our rabbonim have decided that, as long as the people in a photograph are dressed according to the halachic parameters of tznius, there is no reason a photo of a woman cannot be published. But the question remains as to how Oorah should balance the various sensitivities of its diverse base of supporters. Unfortunately, each option holds the possibility of diminishing our contributions, which in turn deprives Jewish children of the opportunity for a Torah chinuch. Option One: Do not publish photographs of ladies, so that those who are offended by such photos will be able to welcome Oorah’s printed materials into their homes. In this case, Oorah would be likely to lose support from the “middle-to-left” segment of our supporters, who are offended by the deliberate omission of half the people Oorah serves. Option Two:Include photos of ladies so that we can depict the reality of what we do – for instance, showing families at our Shabbat With Oorah or staff and campers at GirlZone. This option would be within the guidelines set by our rabbonim and would not offend the “middle-to-left” supporters. However, it would offend a portion of those in the right-wing sector, who might then cease to support Oorah and cease to accept its printed materials into their homes. Option Three: Use photos of ladies, but only those that are reasonably small and inconspicuous. This would address the sensitivities of both sides while still allowing Oorah to show a realistic view of the kiruv we do. Because my own choice ("Your use of the word 'ladies' offends me.") is not represented, I'm struggling to choose between options ONE and THREE. On the one hand, I think picturing women might lead to dancing. In fact, it sort of disturbs me that Oorah even allows women to attend their events. I'd much prefer that they stay in the house where they belong. However, the idea of using small and inconspicuous pictures of women appeals to me, too, because it suggests that women are inferior and worthy of disrespect, and I think that in addition to kiruv, Oorah should be making it known, both far and wide, that God likes men best. So here is my compromise idea: Follow the conventions of the Elizabethan theatre and have men dressed as women pose for the pictures that are used in the promotional materials, but make the photos extra small and caption them as follows: STOP LOOKING AT THESE PICTURES OF FAKE WOMEN YOU PERVERT. The words should, of course, be larger than the pictures. And if it helps you can also use a photo of me, wearing a fake beard, and tell everyone that I was the Rav who approved this idea. Oh, was Iowa last night? This notion that either of the Iowa winners now has some kind of momentum or significance does nothing but illustrate the central deficiency in the whole primary/caucus system: in this gigantic, diverse country of no one should be anointed anything on the basis of the results in some two-bit state like Iowa. Memo to my pal Lurker: How'd your boy Rudy do? I didn't have time to read all the way to the very, very bottom of the results. I assume he's down there somewhere, because he sure wasn't anywhere near the top. Maybe I should teach pre-1A? Unintended irony alert: Isn't it interesting how this ad reminds people that Osama is still on the loose, and the world is even more of a mess than it was when the Republicans took control of the presidency, the congress and the judiciary? I mean, isn't the subtext of this ad something like "Boy did the Republicans screw up, so... Vote Republican!" The other side's comeback: Uh.. In a dangerous world full of threats, we need a mayor with less foreign policy experience than my second cousin's pet poodle? Worry: Is this what we can expect from now on from the so-called party of ideas? "Be afraid, be afraid, vote for me?" How 1984. 'I'm in the private sector and for the first time in my life I'm earning money, you know that's sort of part of the Jewish tradition and I do not find anything wrong with that." About mid-way through the ad, during a litany of accusations against Mitt Romney, Huckabee criticizes his rival with this data point: "No executions." Apparently, Huckabee -- you know, the evangelical, pro-life Republican -- is going after Romney for not having executed any Americans during his gubernatorial tenure. I realize Republican politics are far more crass than norms should allow, but it's disconcerting to think "You didn't kill anyone" has suddenly become a criticism in conservative circles. Alas, Massachusetts (and this is the humorous part) has no death penalty. Isn't that great? According to Huck, Mit isn't a suitable president because he followed the laws of his state! Way to go, Law and Order Republicans! And the law, of course, gives Mitwit the perfect GOP excuse: "I'd have killed PLENTY of people," we expect Governor Flip-flop would say, "only those durn liberals who elected me governor after I successfully appealed to their sensibilities wouldn't let me!" To which Huck, no doubt, would reply: "Pansy. If you were a real Christian republican you'd have killed them anyway!" This guest post was submitted by a reader, who approved of David Gruber's column about intermarriage. S/he is not the same writer who is joining the blog later this month, nor has s/he written for DovBear before. Human beings at one time believed that inanimate objects held powers. They progressed toward a time when humans became capable of abstract thinking and symbolism. The human psyche then evolved further and became capable of developing the concept of monotheism. We (humans) are now in the midst of leaving monotheism behind, as CA wrote, agnostics may be the silent majority. Soon we will move toward atheism because we simply won't need to explain the working of the world and the meaning of life based on an omniscient parent figure that through setting rules and system of reward and punishment determines how we should live our lives. We will understand that through utilitarianism and humanism we can have a wonderful, productive and civilized society based on values, morals and ideas that come from within us and not from some external force. Of course the values, morals and ideas came from within us all along. Can Moshiach ben Dovid be a girl? My kids like to ask me about difficult topics. God, for one. Death, for another. Salvation, the afterlife, the Chosen Nation, reward and punishment, and so forth. And of course, mashiach. "When is he going to come?" "When he comes are we going to move to the Beis ha-Mikdash?" "My teacher said all the shuls are going to fly to Yerushalayim. How are they going to fly if they aren't airplanes?" Etc. So I provide straight answers to the best of my ability, watering it down for age purposes, generally trying not to confuse them by blatantly undermining their teachers unless it's absolutely necessary. So over Shabbos my five year-old daughter asked me, out of nowhere, if mashiach can be a girl. I have to say that threw me for a loop. I mean, CAN mashiach be female? To the extent that there are texts on this topic, I confess to not being very familiar with them. Is there any actual reason to say that no, it's impossible for mashiach to be a woman? I imagine that there is such a reason, but I don't know it, and I never say anything unequivocal if I don't have the background to explain it fully. So, not knowing what to say, I went with the old parental stand-by that usually works wonders for us in cases like this, and I said to my daughter, "That's a very good question. What do you think?" And she said "I think mashiach could be anyone. Because otherwise, it wouldn't be fair." Update: The author adds: "I realize the texts say "him", but if it were in fact possible for it to be a him OR a her, the texts would STILL say "him", since that's the "generic." Mrs. DovBear is celebrating a birthday this month, and I thought it would be really swell if the blog chipped in to buy her a gift. Here's what I am proposing. If you click this link you'll be taken to my blogad homepage. Blogads are completely anonymous - unless you put your name in the ad, I won't know who paid for it. You can buy a blogad to promote your own blog or business, or just wish Mrs. DovBear a happy birthday. I don't care. In fact, because it's all for such a good cause, (ie: My wife's birthday present from the blog) I'll even tolerate Republican slogans. So knock yourselves out.